If you’re looking for a casual holiday game, this one will surely hit the spot! “Grinchmas” let’s you play the part of Mr. Grinch on Christmas Day. If you’re feeling like a mean grinch, you can throw snowballs at the houses in Who-ville. If you’re feeling like Mr. Nice Grinch, you can shower the houses with gifts! The game is pretty simple. 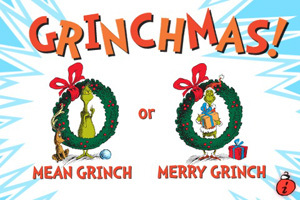 There are two gaming modes — Mean Grinch or Merry Grinch. In “Mean Grinch” mode, the houses in Who-ville are making too much noise for the Grinch. Splat each noisy Who house with a snowball to quiet them down. Do this by simply swiping the phone / iPod Touch. Keep throwing snowballs and see how long you can last! In “Merry Grinch” mode, the object is to deliver matching colored presents to the Who houses within 2 minutes. Swipe the iPhone / iPod Touch to toss the presents. As each present gets delivered, the Grinch’s heart grows bigger and bigger. The Grinch’s heart grows smaller if the present and house colors are mismatched. How big can you make his heart grow? The two modes are both simple and fun. I find that aiming at the houses can be a tough though. It may just be because I need a lot of practice. The speed and accuracy of the swipe will determine if the snowball/present hit the right house. Grinchmas Itâ€™s fun for the whole family, even big kids like you! Grinchmas is available in the iTunes App store for just $1.99! Disclaimer: Iâ€™ve received a promo code for â€œGrinchmasâ€ iPhone app from Oceanhouse Media in exchange for a review.